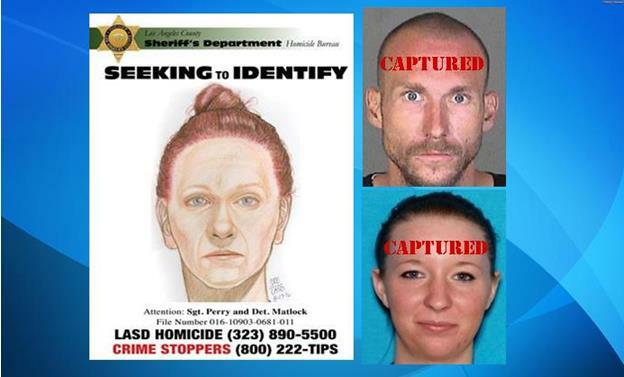 Kimberly Harvill [left] shown in a drawing authorities released in hopes of identifying her after her body was found. Suspects Joshua Robertson and Brittany Humphrey were arrested Thursday, Aug. 25, in Pueblo, Colorado. LOS ANGELES – Arraignment was postponed Monday for a couple charged with killing the woman’s stepsister — whose body was found near state Route 138 in northern Los Angeles County this summer — and kidnapping her three children. Britney Sue Humphrey, 22, and her boyfriend, Joshua Aaron Robertson, 27, are charged with murder in the death of Humphrey’s 26-year-old stepsister, Kimberly Harvill of Fresno, on or about Aug. 14, according to the Los Angeles County District Attorney’s Office. The criminal complaint alleges that Robertson personally and intentionally discharged a handgun, killing Harvill. Robertson, who is in custody, refused to come to court Monday and his arraignment was continued to Tuesday. Los Angeles Superior Court Judge Gustavo Sztraicher set bail at $3 million pending that hearing. Humphrey appeared in court Monday in orange jail clothes and was ordered to return on Dec. 15 to enter a plea. Her bail was set at $2 million. Harvill’s body was found Aug. 14 in some brush by a motorist traveling along Gorman Post Road, north of State Route 138. She had been shot in the upper body, the sheriff’s department reported. Humphrey and Robertson were arrested Aug. 25 in Pueblo, Colorado, one day after Harvill’s three young children — ages 2, 3 and 5 — were found safe in a motel outside Albuquerque, New Mexico, in the care of a good Samaritan who notified local law enforcement, authorities said. At the time of their arrests, the two were charged with three counts of kidnapping involving the children and were wanted for questioning in connection with Harvill’s killing. Along with the murder charge that was added in September, Robertson is charged with a felony count of possession of a firearm by a felon with two priors. The criminal complaint alleges that Robertson was convicted in Fresno County in 2014 of being a felon in possession of a firearm and evading a pursuing peace officer. Robertson was on post-release community supervision, according to the Los Angeles County Sheriff’s Department. If convicted, the two could each face up to life in state prison, according to the District Attorney’s Office. UPDATE: Arraignment has been postponed to Dec. 15 for Joshua Aaron Robertson. 2 comments for "Arraignment postponed for couple in stepsister’s killing"
Excuse me….refused to go to the Court Room?! Cuff and drag his sorry self to the courtroom and take care of business. Stop wasting our tax dollars on crapolla!